PC-1 is the basic conditioner in the GigaWatt line of products, designed as an element of effective protection, filtering and power distribution for audio and video systems. 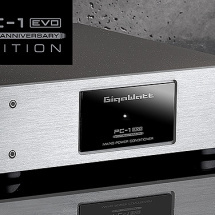 Despite the fact, that the PC-1 EVO is the cheapest power conditioner offered by the company GigaWatt, it proves itself as a device powering reference music and video gear. This conditioner not only effectively protects from any kind of interference and overvoltage in the power grid, but most of all warrants visible improvement of the sound and picture quality in the powered devices. The unit excels with a solid construction, usage of selected components and high quality and aesthetics of workmanship. In the modular construction of the PC-1 EVO we resigned from using separation transformers and applied a worked out, multi-stage, parallel filtration instead. The conditioner is equipped with two independent filtering branches, separate for each pair of output sockets. Due to this solution the filtration of each of the branches was adapted to the character of the load, that will be used on those sockets, different for each kind of devices – digital, analog or high current draw units. The autonomous passive filters allow for isolation from interference generated by devices connected to a common power line. The PC-1 EVO conditioner is made from high quality elements. Due to the increased efficiency of the new filtering circuits they were mounted using silver solder on massive PCBs with double-fold content of copper compared to standard PCB. The one layered PCBs have very wide conductive traces made from 70 micrometer thick copper. Damping of the interference is made in RLC type filtering blocks, built using, among other things, metallized polyester capacitors with low inductance and IP (Iron Powder) core filters. In this conditioner we also resigned from using traditional protective elements, like wire or thermal fuses, which throttle the free flow of current to the protected circuits and by this have a negative influence on the sound. The overvoltage protection of the conditioner is guaranteed by the start block, which contains plasma spark gaps, next-generations of UltraMOV varistors and an initial filter. Those elements, working together with a well designed, modern power grid, warrant a complex protection against overcurrent and overvoltage. Optionally, the power conditioner can be equipped with the circuit, which eliminates unwanted DC component from the mains (DC Offset Blocker). The Direct Current component (DC Offset) is a very unfavorable phenomenon, which exists in almost every electrical grid. It results in the Alternating Current (AC) sine wave become asymmetrical, what negatively influences any device using transformers. Their cores get magnetized, what translates in higher operating noise (hum), diminished efficiency of the power supply and finally in degraded sound. The DC blocker effectively eliminates this phenomenon without causing any compression or having any other negative influence on the sound. The PC-1 EVO conditioner is equipped with four high quality power sockets GigaWatt G-040 Schuko, designed and manufactured by the company. The brass connectors of those sockets were silver plated at the factory, without the usage of intermediary metals, like copper or nickel, which could introduce unfavorable series resistance and voltage loss. The increased area of contact and the thick layer of silver guarantee sure contact with the plug pins. The sockets were additionally subdued to cryogenic modification and a demagnetizing process. In order to effectively protect children, the G-040 sockets were equipped with integrated anti-surge shutters (increased protection against touching, conform with VDE 0620). 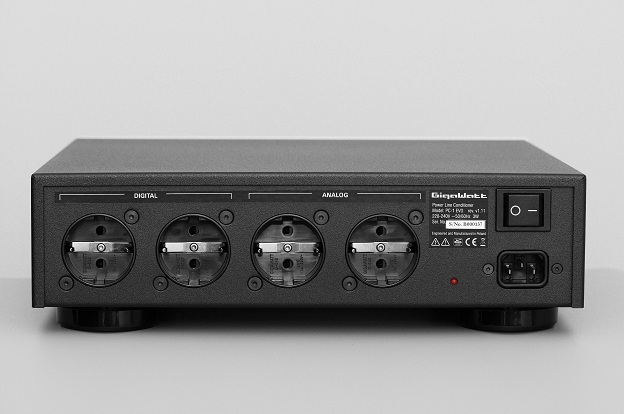 The PC-2 EVO is also available with outlets of type NEMA 5-20R, used in North America and some Asian countries, and with Australian outlets of type AS/NZS 3112. All internal elements of the conditioner were enclosed in a rigid, steel-aluminum chassis, which is supported on anti-vibration feet. The front of the unit is made from a plate of solid, milled aviation aluminum. This panel, with brushed and anodized surface is available in two colors – silver and black. 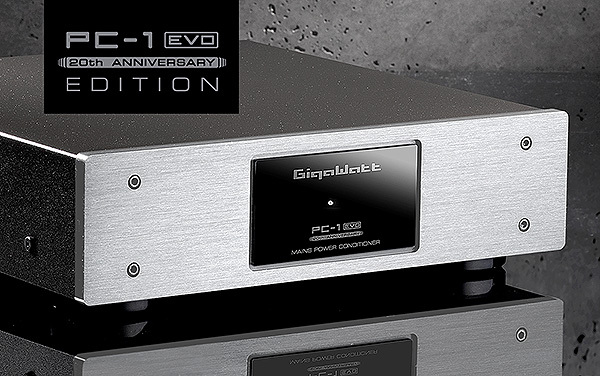 The PC-1 EVO is, by standard, equipped with the power cable LC-1 MK3 with 1.5m length. To fully utilize the maximum potential of the PC-1 EVO we recommend the usage of the LC-3 MK3 or LC-2 MK3 power cable. All GigaWatt products are covered by an insurance policy for the connected equipment, with a total insurance value of 1000000 PLN. The insurance does not apply to the United States and Canada. The Gigawatt PC-1 EVO is a modest looking and featured device for filtering noise and protecting hi-fi gear from power surprises. 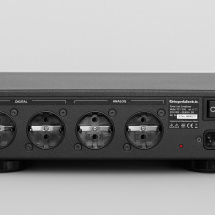 To say it short – it is a power conditioner. And let us add, it is the simplest one in the Gigawatt catalog. Simplest, so also the cheapest one, and destined to be the most battered one. But is it true? Setting up the company hierarchy is not easy this time, as the PC-1 EVO, even when compared directly with the flagship PC-4 EVO, does not need to be ashamed of anything. Yes, it has only 4 output sockets instead of twelve, and when you try to list technologies used in it, most spaces will remain empty. But the “one” brings good energy, openness and vividness into the sound. 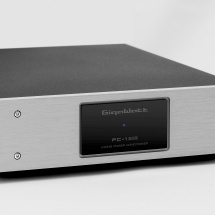 It is not as refined and smooth in the upper registers, or as saturated in the midrange as the reference model, but it helps the amplifier to control the bass completely and brings the so needed pepper into the music. It can breathe new life into a system, and put the sounds in their rightful places on the timeline. I hope there will be more devices like this one. 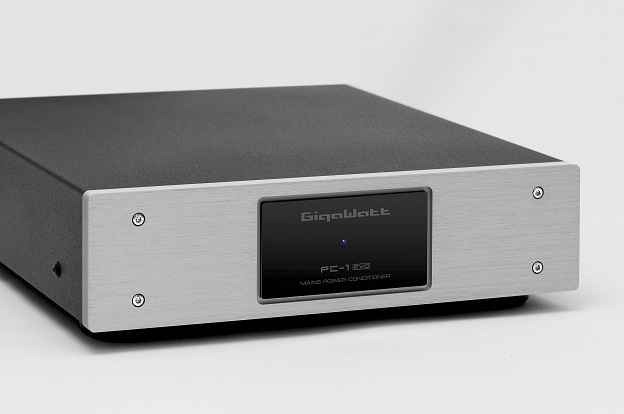 „PC-1 was tested in a home cinema system, powering a Blu-ray player, receiver, TV set and an active subwoofer. In this configuration, the treble profited most; they were completely cleaned from any harshness, and fed our ears with more details. The sound became broader and less aggressive in perception, and this happened without impairing dynamics, which is so important in a home cinema setting. The picture on the LCD screen had improved colors, became also very fluent and sharp.